The wonder of worm farms is the organic fertilizer they produce. The wonder of worm farms is that they will turn your kitchen and garden waste into food for your chickens; and provide marvelous compost and a liquid organic fertilizer for your vegetables and salads. They are without equal. This page was last updated by Bernard Preston on 7th December, 2018. And now here's an update on our worm farm; firstly we've grown to four tanks, though only three are in production. Finding enough food for them is the limiting factor. Recently I've taken to collecting scraps from the local supermarket; it's not a pleasant business, but the hens, and even our dogs have benefited. It's eleven months since we made a start and the growth has indeed been astronomical; the hens get a 500ml tub of worms once a week. I could give them more, but we're trying to expand the farms still, and supply the compost heaps. When all four worm farms are busy, the birds will get a tub every day. If you're commercially minded, you could make a business of breeding and selling worms in your neighborhood; or the wee, for that matter, but they multiply so prolifically that I suspect most folk will happily part with an ice cream container of their creepy crawlies for a jar of homemade jam or a bottle of honey. One of my chiropractic patients just did; thanks Jono. Test the market before investing in a large number of tubs; ask your local plumber for rejected concrete laundry basins but in fact they will breed in virtually any structure on the ground. Raising it makes collecting the worm wee easier, that's all. Your baby worms will grow to maturity in about three months depending on the amount of food you provide. At around a gram apiece, a thousand adults will weigh a pound or two approximately. Here's an update; four months after we started with I think about 500 worms; perhaps a bit more or less, because we didn't count. They were donated by a friend. Well, the farm is simply crawling with the little beasties; and now we are in the rapid growth phase and will have to starting sourcing more food. They would weigh about a ton, if you gave them enough food; that's the power of geometric progression. It's the same as the old Persian story of the king who offered a nave either 60 bags of rice, or one grain on the first square of a chessboard, two on the second, four on the third, and so on. Your organic worm farms consume an incredible amount of food. Very rapidly they will outstrip your kitchen. Each worm consumes its own weight per day. That means that a 1000 will need a kilogram of food. But, after a month there will be 2000 worms; they will demand 2kg of kitchen waste. And after a year, those starving worms will be demanding a ton or more of food every day; that's a lot of potato peels, rotten apples, and moldy pumpkin. Starting a worm farm is actually not a big deal, but collecting enough food will keep your imagination stretched; we'll talk more about that lower down. What you need is two large containers; those old fashioned concrete laundry tubs would be perfect, but I've located an old fibreglass mold that is no longer in use at a local business. It's about a metre square, by 500 cm deep, divided into two chambers. Each has a waste plug so that you can drain off the liquid manure. Make sure you leave the plug out, or they'll drown if too much water accumulates; cut off that pipe stub as short as possible, just long enough so that it protrudes through the plastic ring bolt. You want the whole structure to be as near to the ground as possible. Since they are living creatures, they need air, so you need a loose fitting lid covered with plastic to keep heavy rain out. It must be dark in there. Here's a bit of worm farm diy. 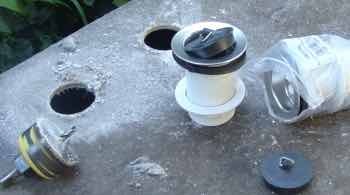 Having found your containers, using a hole saw, drill an aperture in each half the size of a common waste fitting. Mine were about 50mm at a glance. There's no need to epoxy them in, but make sure the nut is tight. 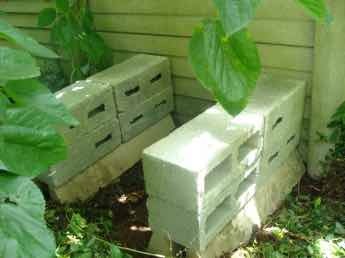 Some concrete blocks, up against this wall, in the shade of a mulberry tree makes the perfect spot for my worm farm. It needs to be cool and shady; this is south facing, protecting them from the hot northerly summer sun in South Africa. Make sure those blocks are sloping slightly downwards in the front; you want all the liquid in the worm farm to drip out. In fact it turned out to be less than perfect; just over the wall is the apiary and they don't like the smell of a farm; open the lid and the bees may go berserk. I had to move the worms. And, three rows of concrete blocks make the structure too high. Later I lowered it to two; just high enough to get a bucket under the pipes; and I'm considering only one block and digging a small trench to slide the bucket into. Make it as low as possible; it's hard work digging out the vermicompost. "Believe it or not the worm casts are full of biotic material which is, so it is said, very good for health. Our dogs eat them and I know of a farmer who is feeding worm casts of a more refined type to his dairy herd to great effect. It is claimed he has a teaspoon daily himself!" Rainbow worm farm is what I've called it; it makes up an important part of our backyard permaculture. South Africa is known as the rainbow nation. The worms love the thousands of overripe mulberries that drop out of the tree above them in summer, giving them the purple carotenes they need just as we do. This is the fibreglass mold nestled up on the blocks that was the introduction to the wonder of worm farms for us. It looks like it was used for making a sitz bath, or some such. Make sure you leave the plug out, but cover the outlet with some gauze. Place a bucket under the pipe. Don't lose that plug, you're going to need it later. One of the sadness of the rainbow nation is that garbage is not collected in many tribal areas; kitchen waste simply gets dumped anywhere and everywhere and a pestilence of rats ruin all local gardening efforts. One of the wonders of worm farms is that they deal with that garbage and because they are sealed the vermin can't get in. So, what do they eat? That's the wonder of worm farms. Frankly just about anything, and in particular anything raw, with the exception of acidic fruit like citrus and pineapples. There's a question about bread too; you'll have to experiment. Any dead birds, moles or rats in your ceiling that you've electrocuted are perfect too. They'll even eat small amounts of cooked meat, as in a half eaten hamburger. 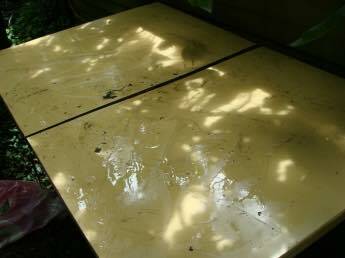 Cover the whole with a layer of compost, large dark leaves like the outer covering of cabbages, or some wet newspaper or cardboard to keep them in the dark, and a loose fitting lid of some sort, covered with plastic to keep heavy rain out; they breathe so air must get in. Update: if those lids keep it sufficiently dark in there, they don't seem to mind if there's no newspaper or cardboard, and will be just below the surface; I still like to cover them with old cabbage leaves that they love, lurking just below the surface. If you have a problem with rat infestation, then it's important that the worm farm covers are reasonably tight fitting, but loose enough to allow the free passage of air. Having the right compost bins gardening makes your life a lot easier. Start by tossing in half a wheelbarrow of compost which they love. They need large amounts of calcium, so I've thrown in a handful of agricultural lime; in the winter months I use ash from the woodstove instead. Then I added a bin of organic waste from the kitchen, mixed it all up, sprinkled it using a watering can until water starting dripping out the waste, and released the worms from that icecream container. Actually, in summer I like to use the husk leaves of our corn, rather than newspaper to cover the whole mess. Newsprint has a lot of junk in it that I don't really want in my garden. After a compost pile, a worm farm is the next logical step in your own personalised operation end waste. It's a significant part of getting your garden soil ready for planting. The wonder of worm farms is that they are so easy to feed; they'll survive if you neglect them, but do remember to keep the plug out, and add a fine spray of water periodically. Like us humans they need a varied diet for optimal and healthy growth. Every few days add something like this to the menu. 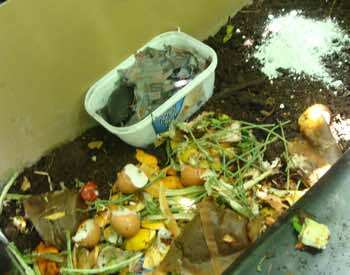 The organic waste from the kitchen. Up to a quarter, cardboard soaked overnight in water. Dead creatures found in the garden. 1 TBSP lime or wood ash occasionally. They particularly like half avocado or gem squash skins for nesting in, a friend tells me. Keep meat and bread to less than 10% of the feed. You may want to test these out but, as a beginner, I recommend you avoid them; they certainly can spoil the wonder of worm farms according to the gurus. Now I'm less fussy with these, except chicken litter. The worms are very tolerant. Organic worm farms is what it's about; all those raw scraps, peels and rotten fruit and vegetables. They'll turn it all into magnificent compost. Right now the peaches are fruiting and a lot of stung fruit is falling to the ground; it's a breeding ground for fruitflies that will sting next year's crop. We are collecting them; it's simply another of the wonder of worm farms. Within a couple months you'll have a seething mass of little red worms, growing in numbers exponentially. The wonder of the worm farms is that you can use the liquid that drips out of the bottom for liquid manure, the worms themselves for a high protein chicken food, and any robins you particularly love, and what's left is the vermicompost; it goes into your compost pile, and I suppose could go straight into the garden. It's important that the process remain aerobic; adequate oxygen must get down to the depths, because anaerobic activity will stink. Some folk use cardboard to keep it aerated but I'm reluctant to use anything with chemicals; so we use coarse weeds and garden material; don't make it too deep. As you can probably tell, I'm a novice; it's only a little over a year since started and we're still learning, but a couple hundred worms has exploded into uncountable hundreds of thousands, like the sand on the seashore! Worm farm instructions continue as follows. It's time to colonize the other half of your tub. As before, place gauze over the plug hole, leave it open, and add half a wheelbarrow of raw compost from the garden and some lime; then water the whole until it drips out of the waste. Actually I no longer use the gauze; it contributed to making the bottom too wet; we lose very few worms into the bucket below. Of course you can make this bigger or smaller according to your desire, and the amount of food available and the size of your garden. Reach through the wriggling mass of worms to the bottom, remove the gauze and put in the plug you've just removed from the second tub. Slowly half fill the tub with water, taking care not to add too much or they'll drown; and not so fast that they don't have time to move to the surface; dribble it in. I prefer to do it by the watering can, rather than the hose. If you forget you'll have a worm farm cemetery. Leave your cardboard or old carpet in place if the lid isn't sufficient as they don't like the light. Using a garden fork scoop out the seething mass of worms, adding them to the second tub. Within a year, when you have hundreds of thousands, you'll reserve some for your compost heap, remembering to cover them; the light will kill them. And of course, if you have chickens, the wonder of worm farms will in a moment reveal a gourmet meal; you're about to witness a scene of total poultry delight; like gannets they plunge into the sea of worms. Something akin to having a tender fillet steak and large summer salad, with avocado and hummus placed in front of you. 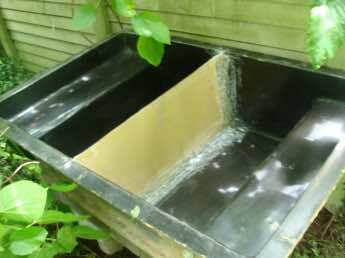 What's left in the tub is the most perfect vermicompost for your garden. If you want to go on to a million worms, then immediately populate the original tub again with some of the worms. Otherwise, just repeat this process every month or so, and feed your surplus worms to the birds in your garden, or hide them in the compost heap. Empty the wee bucket once or twice daily; a few baby worms may manage to slip through the gauze and will drown in their own urine! A little tip of some import; when you remove that plug, don't take your eyes off of it! If it's black it very easily gets lost in the muck. Mine's gone! To be honest I haven't replaced it; air in worm farms is important. Keep the worm farm covered with a layer of compost; the worms love it, and it prevents the whole from stinking in the summer; empty the wee regularly; it does smell. Compost piles and worm farms go hand in hand; humus thrives with the wonder of an addition of worms, and adding a shovelful of compost to the top of the drum keeps the unpleasant smell to a minimum and the worms love it. Starting a compost pile is vital in every organic garden; it's the only way for your plants to get a healthy diet, and of course will have an add on effect to your own health. One starts the wonder of worm farms with advice from a book or friend, and then continues to update their technique. I now forego the putting in of a plug and slowly filling the whole with water; it's too tiresome. Most of the worms are in the upper half of the tub; that goes into the second chamber. The lower half just goes straight to the compost heap to which the hens are admitted for a period. 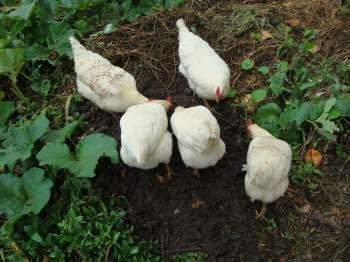 The longer you leave the hens there, the fewer the worms that will survive to inhabit your compost pile; better eggs but the humus will take longer to break down. Finding enough food for the wonder of worm farms is a mission if you really want to grow the numbers. Remember, within a year you're looking at a ton of food per day if you don't release the worms into the garden, and feed them to the birds. Ask your local green grocer or supermarket if they'd fill a bin of old fruit and vegetables every day. Place a couple bins at the local primary school for left over lunch. Ask them to remove any inorganic wrappings and place in another bin right next to the one for worm farm food. The worms will love any half eaten sandwiches. In return give them a couple litres of liquid manure for the school garden every now and then. Leave a bin at your front gate and ask the neighbours for their organic waste. And of course all the waste from your own garden. If you're a serious greenie, invite your children's class to come and see what's needed to preserve the planet; they'll be fascinated by your worm farm and compost heap and, if you have one, chicken tractor. This is far too important to leave to fickle politicians and Cop 21; it's our responsibility, and vital to hand on to the next generation. After all they will have to live on the polluted planet we have left behind. There are more thoughts on this subject of finding enough food at my attempt to answer from another angle what is a worm farm? Cardboard in worm farms makes a useful bulking agent, increasing the porosity of the feed and maintaining the water content. The vermi-leachate is a wonder above the other wonders from your worm farm. Place a bucket under the outlet and decant it regularly onto your favourite plants; it smells a bit so empty it frequently onto the garden if the worm farm is near your home. I suggest twice a day in the early stages as, with the best will in the world, some of the baby worms will get through your sieve and try to commit suicide in their own leachate. When you have a couple million, you'll be less concerned. They are amazingly resilient though and even though under water for several hours, they will revive. Just watch the bucket; if no worms get through then you can obviously leave it longer. For many the worm wee is the major wonder of your worm farms; it saves you purchasing foliar feeds. Does it really make a difference? Follow our rainbow worm farm experiments using corn as the medium in this instance; I don't actually know the answer, so I'm as intrigued as you are! Then all the trees on our citrus fruit list and the avocados regularly get a bucket of diluted worm wee; even our cymbidiums are flourishing. Don't use worm wee though on young seedlings unless it's thoroughly diluted; at least ten times. It will burn them. My choice method is to pour the worm wee straight on your mature plants either just before or after a rain, or water it in thoroughly; it saves a lot of time. Doggy poo worm farm is the perfect way to dispose of a problem all pet lovers face. Cat litter and guinea pig wood shavings will go equally well. Don't use this worm wee for your lettuces, though, for obvious reasons. It only goes on your flowers and fruit trees; well, perhaps on the corn is okay. Doggy poo worm farms don't smell much because you cover it with a layer of compost, as well as the usual waste from the kitchen; but the worm wee needs to be disposed of daily; it does smell if left for too long. As with most things to do with permaculture there is some extra work to be done with the wonder of worm farms. Chicken tractor design goes hand in hand with the wonder of worm farms. Your kitchen and garden refuse gets turned into wondrous food for your chooks. They in turn root out the weeds, cutworms and snails and other predators that destroy your seedlings, and give you wonderful healthy eggs which have not had artificial colouring added to the food to deceive you into thinking that they are from free range chickens. Once the wonder of worm farms is in full production, you can easily spare a handful of creepy crawlies every day to add protein to the chickens' diet. The chicken manure adds valuable nitrogen to the soil, obviating the need for inorganic fertiliser, but don't add it to the worm farm. Just look at the hens tucking into the worms; it's Christmas! Chickens in the garden are a wonderful addition, but planning and aforethought, as with all new projects is needed; they'll scratch out your carefully planted seedlings and simply devour the kale; they need the lutein for their sharp eyesight; so do we. Birds and bees may not mix, especially if you're toying with the wonder of worm farms. I’m sure you all know that a wheelbarrow of newly mown grass is a red rag to a bee. Not many of you also have a worm farm, I expect. Opening a worm farm, if anything, is even more of a signal to bees to go absolutely berserk; perhaps it’s the hot dry weather, too. It’s strange because they produce little odour to us, but to the bees it’s maddening. Research scientist Mike Allsopp also points out that if the lesser hive beetle gets into your worm farm, they’ll consume all the worms. In short, if you plan to indulge in the wonder of worm farms which you’re likely to do if you are a greenie, then keep it well away from the apiary. Smoke did nothing to curtail the madness, but a fine spray from the hosepipe did wonders. They stung the hell out of our hens for the first time. What’s the virtue of a worm farm? They’ll consume all the kitchen left overs, produce a “worm wee” that makes a magnificent feed for your plants and, if you have hens, provide a high protein feed for the birds. The thrushes love them too. In your compost heap they speed up the break down of vegetable matter. We have some pesky weeds with bulbs called oxalis that can't go in the compost heap; feed them to the wonder of worm farms too, or to the chickens. The wonder of worm farms is that they solve a lot of problems in the garden; disposing of doggy poo and cat and hamster litter, and fruit and veggies that have been stung. You don't want them in the compost heap where they'll breed for next season. We have been resolutely collecting and dumping all the stung plums into our worm farm this year; I'm intrigued to see if it makes a difference. We should also let the hens into the orchard and see if they don't sort out the fruit fly like they have the plague of Mexican bean beetle larvae that more or less put an end to our growing green beans. Wizzard worms is an amazing small enterprise totally committed to seeing the spread of the worm farm culture. It's worth a look at Wizzard Worms wherever you live, but particularly if you live in KZN, South Africa, and are interested in getting started. They have perfected the wonder of worm farms. If you're into growing healthy choice foods, then give a thought to the wonder of worm farms; not only will they consume all your kitchen waste, but greatly enhance the plants in your garden. 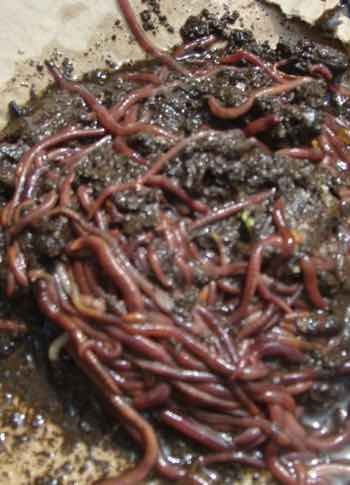 Toss the excess worms into your compost heaps. The wonder of worm farms is admittedly a dirty business but, my goodness the benefits for the organic garden are simply enormous; and a large part of it lies at the heart of the philosophy of operation end waste. On the other hand there are other tensions like whether Fetida should be included on the list of invasive alien species. 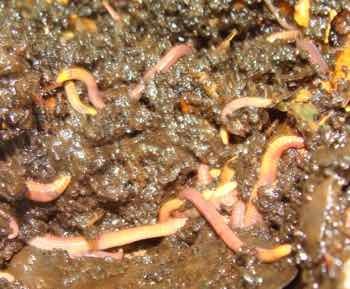 One other not to small advantage of the wonder of worm farms is that by using vermicompost you won't have to worry about the definition of cutworm, as you do with compost heaps; that's where they love to breed, and it's an ongoing problem for every gardener. Go from the wonder of worm farms to what's potting in the garden. Bernard Preston, that's me! writes these blogs for his good pleasure. It's not entirely altruistic! It's where I sell my books; if you've enjoyed this site then you can help me sell a million copies of A Family Affair. Only a dollar each for the trilogy; now that won't break the bank; small beer in thanks for the information contained in the wonder of worm farms.